PaintersOnline, the online home of Leisure Painter and The Artist, has teamed up with Search Press to offer you the chance to win one of ten copies of Vibrant Oils by Haidee-Jo Summers worth £15.99 (rrp) each. Vibrant Oils is a friendly, accessible and inspiring course in oil painting from a regular contributor to The Artist and member of the prestigious Royal Institute of Oil Painters (ROI). Haidee-Jo Summers’ artwork is filled with light and vibrancy. Her friendly, instructional style will demystify oil painting and show you how to use this traditional medium to create contemporary portraits, landscapes, still life and more, all suffused with the unique warmth and richness of oils. This book is ideal for painters at any level of experience, from complete beginners looking to start out with oils, to advanced painters wishing to pick up new ideas and techniques. 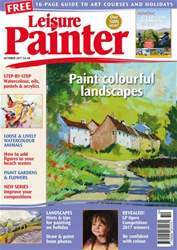 Welcome to the October issue of Leisure Painter (now 80 pages PLUS this month's 16-page art courses and holidays supplement). Aimed at beginners, less-experienced amateurs and hobby painters, LP is the best-selling practical art magazine in the UK. Inside you'll find practical advice, exercises and demonstrations on how to paint with watercolour, acrylics, acrylic inks, oils, pastels and drawing media, as well as tackling mixed-media approaches. With everything from adding figures to your beach scenes to gardens, flowers, animals, still lifes and landscapes, we aim to fill your painting hours. There's even a challenge to complete a miniature medieval initial letter in gold this month. Then sit back and view the award-winners of this year's Leisure Painter Open Competition, and read news on exhibitions, diary events, art club activities, the latest practical art books and our online home, PaintersOnline. The final 16 pages of this month's issue will help you plan your next art course. Enjoy the issue!